I have the pleasure to offer you three of my favorite cookbooks written by bloggers that I know and love! 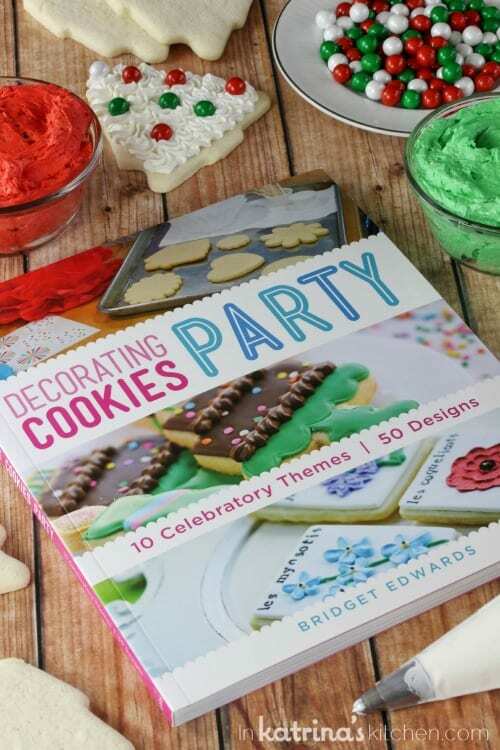 I’ve already introduced you to Dessert Mash-Ups, and The Red Velvet Lover’s Cookbook, so let’s talk about Decorating Cookies PARTY by my friend Bridget Edwards who blogs at Bake at 350. I love a good party! For the past 15 years my best friends and I get together to bake and decorate cookies. We’ve been through boyfriends, college, weddings, babies, moving, sickness, and so much more but we come together every winter to bake together and celebrate our friendship. We exchange over 2,000 cookies, and decorate hundreds more over the course of a day (and a few bottles of wine). So when Bridget told me she was writing her second book about cookie decorating (this time all about cookie parties!) I was excited to get my hands on it! Bridget’s book is filled with over 50 designs and 10 creative themes. My favorite design is the Cake Slice Cookie, and my boys are pleading with me to make the Monster Mash-Up cookies. We have plans to attack those over the winter school break. In the meantime I thought you might like to give yourself a gift- one winner will receive 3 of my favorite holiday cookbooks by some of my blogging friends and colleagues. Be sure to grab the recipe for Decadent Red Velvet Brownies as well as the Sugar Cookie Dough Cups! I’m also including the links to several other cookbooks that I’ve had the pleasure of reviewing this year at the bottom of this post. Each book would make a lovely gift so I hope you have fun looking around for a unique gift for the baker in your life. Let’s Celebrate with a Little Giveaway! I’d love to have these cookbooks in my well used collection of cookbooks. I already own your book and Dorothy’s but I would love to win them all. All 3 books look like they have very creative & fun ideas to try. 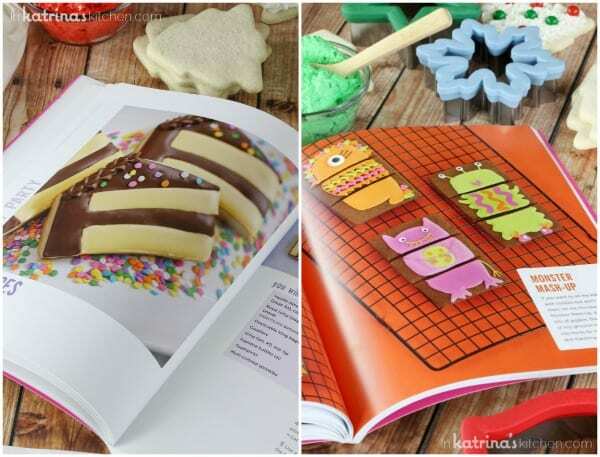 I would love to own these cookbooks! Thanks for the giveaway! Been covetting “Red Velvet Lovers” for a while. Fun Christmas baking giveaway. These books all look like so much fun! Oh, I would treasure these three cookbooks! What a lovely giveaway. All of these yummy books look amazing and would keep me bust this winter! These cookbooks look like so much fun! I am so impressed with all the talent and time that all of you bakers put into these wonderful cookbooks and blogs!!! What a great prize to win for the holidays! This looks amazing -so many great ideas!!! You are so talented! I’m always soo impressed with what things your come up with. Thanks for the chance to enter. I am dying to get my hands on the velvet book!! I love to read through cookbooks and pick out new things to try. These all look fun. Awesome assortment of cookbooks up for receiving. I would love to have these cookbooks. Looks like some fun & creative ideas! Would love to try some of the recipes. I am a sucker for desserts, so I am so grateful for the opportunity to win such wonderful cookbooks! Wow! These cookbooks look like so much fun. Would love to add them to my collection. Thanks so much for the chance to win, and happy holidays! I love baking books. Such great inspiration. ’tis the season for baking – and I could use some new recipes! 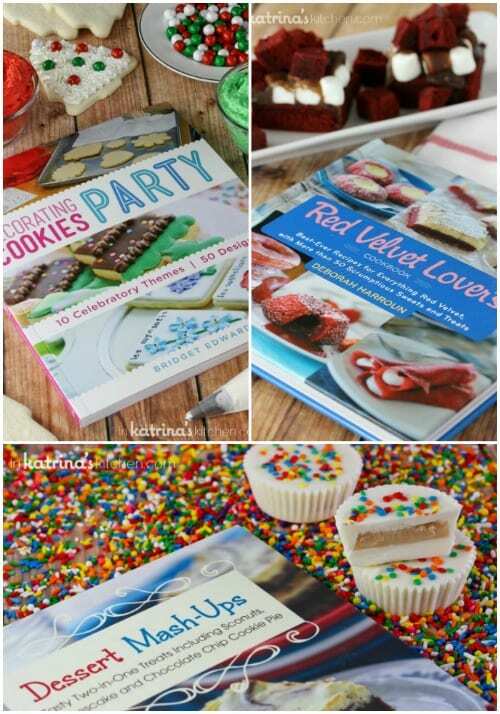 I am the baking queen in my family and would love to win these awesome cookbooks!! Winning these books would be a great gift for me and sharing your food with my family would be my gift to them! Although, Pinterest, blogs and the net are wonderful to get recipes and baking/cooking ideas, there’s nothing like a good old fashioned cookbook;especially recipes for dessert with great photography! Thanks for the giveaway. Merry Christmas to you and your family! Thank you for the giveaway! I love these beautiful cookbooks!! All those cookbooks look awesome. I would love to try those recipes. 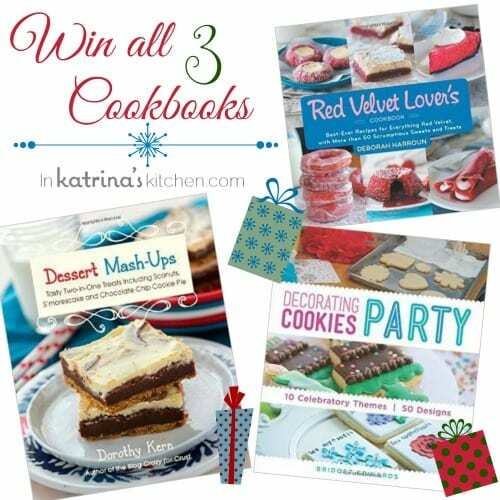 i would love, love, love to win these fabulous cookbooks! Baking with my granddaughters is my favorite bonding experience! All of these cookbooks look fantastic, I would love to win! would love to have all three books. thanks for doing this. They all look like so much fun! Thanks for the chance! These books look fantastic. I love red velvet! I’d love to win those cookbooks! I have the biggest sweet tooth and love all desserts! I love to bake! Is there anything more Christmas-y than a house full of the smell of delicious baked stuff? Thanks for the opportunity to win! I would love to win your cookbooks…my daughter’s and I collect cookbooks and these would be a wonderful addition. Thank-You, so much for posting amazing recipes and contest! These books look wonderful. I love to bake and try new things. HI, Thank you for this great chance to win these 3 great books!! I would love to have all 3 books so I can learn from them to make all kinds of great cookies for Christmas!! I love your blog and all your wonderful recipes!! For all you talented people that bring joy and happiness to all of us not so talented but willing to give it a try in which are thankful to have guidance though your beautiful and cheerful work. Would love to win these for my daughter, the baker in our family! what a wonderful way to ring in my new year. I would live to win these cookbooks and have a whole new box of treats to give away next Christmas. Thank you for sharing recipes with us! I enjoy getting your emails. My kids are looking forward to making the sugar cookie dough cups for a treat on Christmas Eve. Katrina, you have made my Christmas so much Merrier this year! I made your Sugar Cookies and everyone raved about them! Thank you!! Merry Christmas!! I so enjoy your site and recipes. Blessings and Merry Christmas. I would love to add these beautiful books to my collection! Great giveaway! Would love to win your cookbooks! Love this giveaway! Would love to win! Wow! Love this giveaway! My friends and I are getting together this year… your Grinch cookies are on our list!! Can’t wait to try out some of these recipes! I love anything Red Velvet! my new husband is a natural in the kitchen – except when it comes to baking and desserts! and I’m not a natural at all haha. these are great gifts for us to give to ourselves! Thank you for the opportunity to win and good luck to everyone. Happy Holidays, Merry Christmas, Happy New Year to all. These look like you could have lots of fun making all the different items. Hope everyone has a Merry Christmas and a Happy New Year. 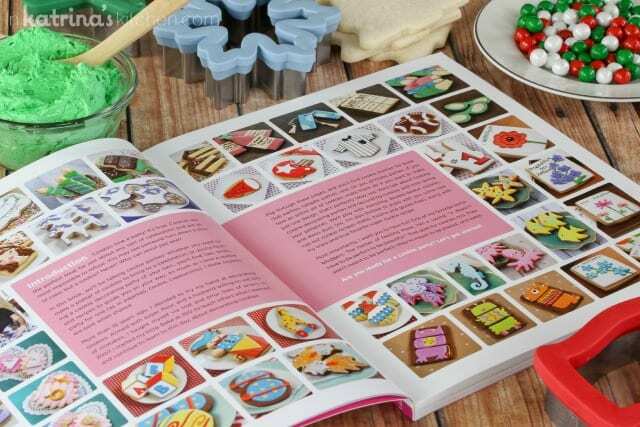 These books look like much kitchen fun!! You can never have too many dessert cookbooks. Bring them on! Thanks for the giveaway chance. All the cookbooks look great and would be fun to own. I have been thinking of buying Dessert Mash Ups for m daughter. Awesome giveaways! I love the many recipes you share so much. I would love to add all three of these cookbooks to my collection! They are by three of my favorite bloggers. Thank you for such a great giveaway!! How fun! One cookbook would be great-but all 3 would be AWESOME!!! Those cookbooks look so fun! Thanks so much! You are so very kind! What an inspiration to continue baking cookies! I’d love to own and use all of these books. Even if I don’t win, I’m buying these books, ESPECIALLY the Red Velvet one!! I would love to try recipes from those cookbooks! They look great! Thanks for the chance! One book for each of my girls. It would be great. I would love to win your cookbooks. I love you newsletter and blog ty Merry Christmas and the Happiest New Year to you and your family! Would love to win cookbooks! Love the Grinch cookies! Thank you Katrina, i would love to win these great cookbooks. There’s nothing like beautiful cookbooks that catch my eye!!! I love your blog and always look forward to making what you post! All of these seem fabulous. I need to spark up some creativity so these would be great! I am a collector of cookbooks, and these would be very nice additions to my library. I would love to win and gift these cookbooks to my daughter who is going to pastry school! Thanks for the giveaway! These look like great cookbooks! We are making your cookies again this year. The kiddos love it. Thank you! Those look like wonderful cookbooks. I have a collection of cookbooks that I would love to add those to. I have been eying that dessert mash up cookbook all holiday season! I would loved to win your wonderful cookbooks and try new recipes ! Ohhhhhh….the Red Velvet Lovers cookbook! Red Velvet is by far my favorite flavor for cakes, cookies, everything! I would love to win these! They sound like great cookbooks. Oh, yippy, I love cook books! I love to bake :)! I love your ideas and creativity! I come here quite often for recipes! They are the best Ever!!! I LOVE these recipes! They are so crafty and I am looking forward to baking for Christmas. Hope I win these recipe books! I would have so much fun making new cookie recipes with my nieces and nephews! I love to bake and make candy! I would love to be able to cook and bake from these new cookbooks. I would enjoy winning the cookbook trio. I would love to win the cookbooks, they look amazing! I would love new cookbooks! I NEED these for my cookbook collection! So excited to try some of these recipes! Especially the sugar cookies…my favorite! Fantastic would love to win !! What a lovely set of cookbooks. I would love to browse through thef “Dessert Mashups” cookbook. I really would enjoy these cookbooks. I would love to add these cookbooks to my collection! Thanks for the great giveaway. I love new cookbooks, especially for desserts! Found this website while looking for a sugar cookie recipe! Love your ideas. these would be a great addition to my already overflowing collection of cookbooks! Found your site from laurlatest page while searching for anything red velvet. Happy Holidays!!! These books have been on my must have list 🙂 Thanks for the chance to win. I just discovered your website through your Biscoff cookbook, yum! I can’t wait to go through your recipes and bake away! Love your blog! Your sugar cookie recipe truly is the best I’ve had! The cookbooks look beautiful and I’d have a hard time choosing just one. I love Red Velvet cake, so the Red Velvet one is high on my list of wants. Wow, these books look great, winning them would be a terrific addition to my cookbook collection. We could have worse addictions, right?? ?